We tend to glaze over when we hear most companies start discussing values and mission statements. It can sound so stiff and HR-centric—more generic and unrealistic corporate babble than actual guidance. At Column Five, we prefer to keep it simple. Everything we are, do and work toward is encompassed in our Five Columns: Do Good Work, Value Our Partners, Be Good to Each Other, Be Humble and Experiment Often. Our Five Columns aren’t just lofty ideals we spout because they sound nice; they’re deeply rooted in our company’s core and culture, as we strive daily to put them into practice. Which is why they live on our walls, keeping us in check and on the right path. Our Five Columns series offers insight into each column. In this post, we examine our fourth column: Be Humble. In every aspect of our business, we value humility and perspective. We know there is always room for improvement. Everyone loves a pat on the back. And while we’d love to win every award in our field, it’s not our ultimate measurement of success (shocking for a Millennial company—we know). Acknowledgement is nice, but when celebrations end and the confetti settles, there are still dishes to do and deadlines to meet. Doing good work, challenging ourselves to create and grow, is what ultimately fuels us. Keeping our egos in check helps us learn from our successes and mistakes alike. We look forward to the next project—not trophy—to display. Divas are super talented people—and a huge drag to work with. We thrive in an environment that nurtures creativity and collaboration, because no one makes it to the top alone. 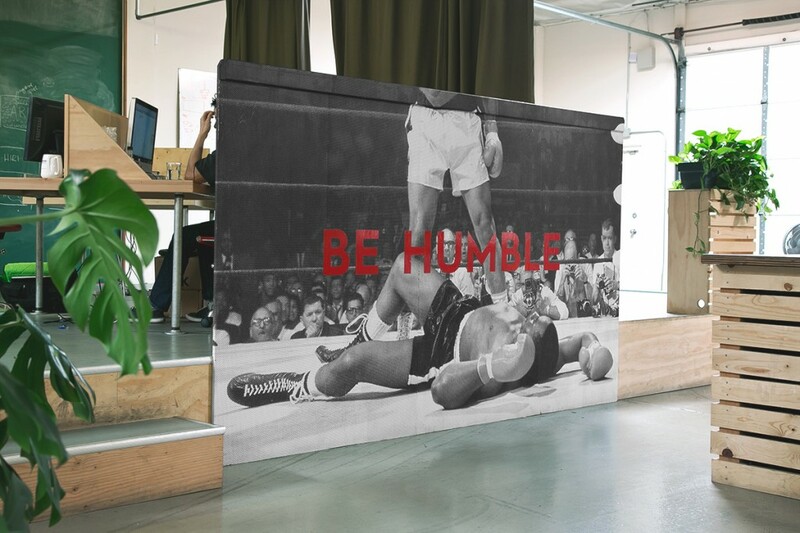 A humble attitude drives our day-to-day activities—from meetings, to email exchanges, to (friendly) office Ping-Pong tournaments. It’s also why we push ourselves to grow and improve through company-wide initiatives. Our quarterly Hack Days give us a chance to solve internal problems collectively. Our monthly Town Hall meeting lets us give feedback regarding how the company is adhering to our Five Columns. And regular project debriefs allow teams to discuss the collaboration process and identify opportunities for improvement. We know we don’t have it all figured out, but we’re always interested in getting there. Although we are confident in our work, we don’t have all the answers. When we approach a working relationship, we do so as co-collaborators, not as condescending creative geniuses. (That’s why we use the word “partner” over “client.”) When a project goes well, we share the success. If it doesn’t, we are willing to accept responsibility. And no matter how a project turned out, we actively seek feedback to see what we can do better next time around. Our partners are the reason we’re in business, and we want to keep it that way. As design geeks, we love to see great visual content—even when we didn’t make it. Recognizing great work from our peers inspires us and pushes us to raise the bar. Whether giving a shoutout on Twitter or circulating an amazing piece internally, we like to share what other people are creating. This helps us engage with our community and support the work that makes our industry great. Ultimately, we want to be a company known for our creativity, kindness and courtesy—because that’s the company we want to work for. Stay tuned to learn more about our next column: Experiment Often.